Without writing a single line of code, you can start processing credit cards professionally using our USA ePay integration. Wufoo's payment integration features allow you to easily process credit cards from your users after gathering information from them through a Wufoo powered form. In just a few minutes, you can be accepting payments, donations and online orders without having to write a single line of code. 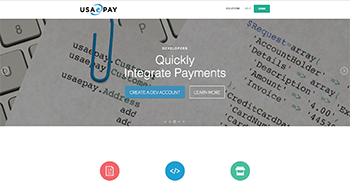 USAePay is a payment gateway service provider allowing merchants to accept credit card and electronic check payments through their Web site and mobile devices.